Chestnut Ridge is Columbus Metro Parks first and only mountain bike trail. The park is located on a ridge and affords views of Columbus some 17 miles to the north. The park property is in two halves - the eastern half is the pedestrian loop and is a great park for hiking and jogging. The western half is bounded by Amanda Northern Road and Mason Road and the trail occupies nearly all of the property on this side. The trail is comprised of two loops that are to be ridden clockwise. From the parking lot, the trailhead is close to Mason Road and begins as a doubletrack grass path through a field. Once through the field, the trail narrows to singletrack and ducks into the woods. In the woods you will find a junction where the Moderate or More Difficult blue diamond trail climbs through a series of short switchbacks from 909 feet up to 1,352 feet. Once at elevation you will see an evident viewing area to see Columbus before entering the woods. On top of the ridge is a rock garden to navigate through. Eventually, this blue diamond trail descends and meets up again with the Easy green diamond trail near the junction for a great ride through the woods before descending and returning to the parking lot. The green trail is 4.5 miles and the blue trail adds 3.0 miles for a total ride of 7.5 miles as of the opening day of the trail. Another 2.5 mile loop is under construction on the land north of the green loop that, when completed, will bring the trail up to 10.0 miles. Review: Good climb for central Ohio fun down hill makes it well worth it! Review: I've been riding here for about 3 years now. With the pump track, dowhill trail 'more cowbell', and single track chestnut ridge has something for everyone. There are a few bridges, 3 drop off on the cross country, 3 drop off on 'more cowbell', bank turns, roots, some table top jumps on more cowbell, that keeps things interested. Review: Likely my favorite local MTB trail. COMBO has done lots of great work to design and develop this trail over the years. Additions over the last few years include a dirt pump track, cross course, several add-on loops (Squatch and Fireball), and a fantastic downhill track (More Cowbell). You won't forget the signature switchback climb to the Apple Barn. 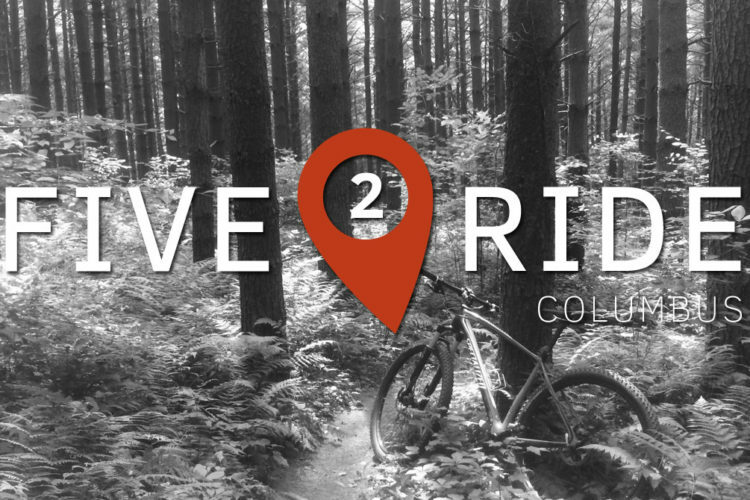 Review: I was visiting family in Columbus and had already ridden the Alum Creek trails and was looking for something different. Trailhead was very easy to find along with the trail being well marked with lots of information at the trailhead. The trail has some elevation gain but it feels spread out except the one section before the ridge itself. The trail is all single track with many man-made features ( very well constructed bridges) and a great down hill section. There is also a skill park type section but I didn't notice it until I was leaving ( appears to be at the start of the trail in the field). Great ride especially for an out of owner. Review: Great way to break in the day! Rode the whole loop I'm guessing about 8.5-9 miles and the climbs kicked my a$$! I wasn't in peak as the season is just starting but it was an amazing trail very natural. They had a pump track as well but the wind made it harder than it would be on a normal day. I only wish some of the switch backs had berms so you could hit the DH sections faster ( slid out pretty good in the last two miles. I highly recommend this ride! 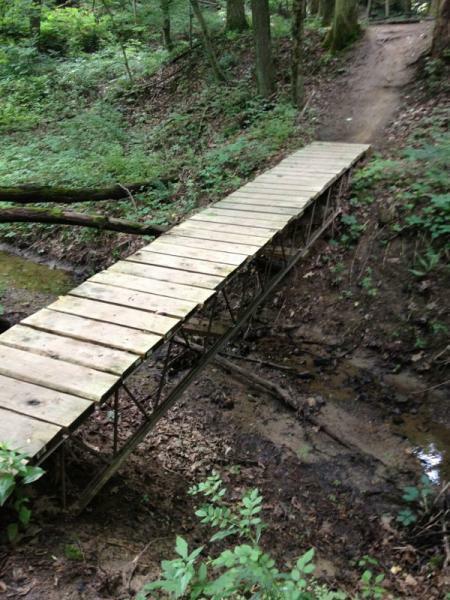 Review: Best trail in Columbus area. Good climbs, fun downhills, not too technical, good drainage. Review: Favorite trail within 30 minutes of Downtown Columbus. I only wish that it was open for Night Riding. Review: My son and I tried the trail for the first time this weekend and it was well worth the drive from Delaware,Ohio. Not as technical as Alum Creek P2 but challenging climbs throughout the 8 mile trail, very well maintained, and marked. Also liked how the trail can be split into 2, 4, 6, or 8 mile segments. Review: I actually live about 5 minutes from Alum Creek, but P1 is a little too technical for me and the consequences for mistakes on P2 are, well, heavy! So I made the trip out to Chestnut Ridge on 4/27/2014, which is about a 45 minute drive. It was totally worth it. The trail is extremely well maintained: zero overgrowth (which means no hitchhiking ticks! ), great trail markings with what I assume are mile markers (I challenge anyone to get lost on this trail), ample parking, and really no blown-out sections (even after all the recent rains). The trail itself isn't too technical at all - there are some challenges, but nothing that made me go "wow, really?!" Basically, enough to keep it interesting but nothing that's there just for the sake of adding to the obstacle count. The climbs were very challenging (at least for me) and I loved it. I ride for the workout, and a workout I received. You're rewarded for these climbs with some really fun descents; the trail has some great flow to it and I truly enjoyed it. COMBO has outdone themselves with this trail and I can't wait to get out there again this coming weekend. Review: This is a fun trail with plenty of elevation. 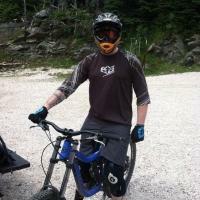 The trail was wet the day that I rode it so a little slow going and definitely a workout with all the elevation. Not too rooty or rocky but enough to keep it interesting. If you want a good cardio workout this is it! Review: Good maintained trail, some challenging climbs with some rewarding decents. Not a ton of flow, but has it sections. Chestnut Ridge MTB Trail 4.29 out of 5 based on 16 ratings. 16 user reviews.